After several months of study, the Jerusalem Municipal Committee has finally approved the construction of a high-rise building in the heart of the Israeli capital, hoping to revitalize the city centre. 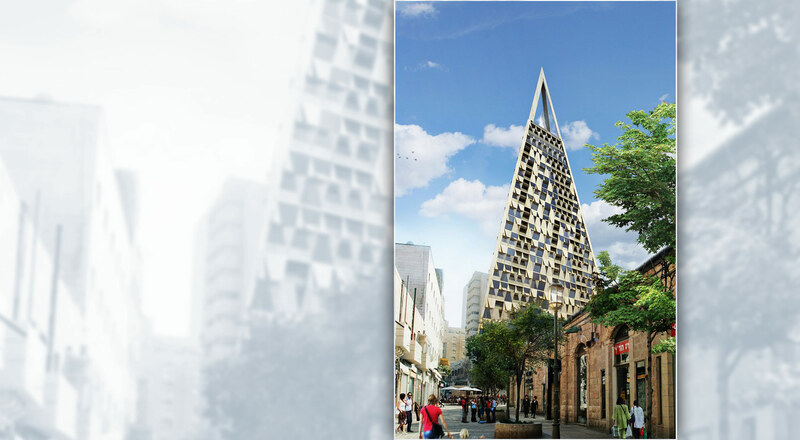 Conceived by Daniel Libeskind, a Polish architect and the creator of the Jewish Museum Berlin and the New York World Trade Center 9/11 Memorial, the ‘Freedom Pyramid’ will be located next to the Mahane Yehuda market in the centre of Jerusalem, atop the ruins of the ancient Eden theatre. Libeskind is joined this time by the Israeli architect Yigali Levi, who designed the tower for multiple commercial applications, in addition to a number of residential units. The structure will consist of stone and glass and have a height of 105 metres lined with Jewish motifs, such as stars of David embedded in its exterior. The 26-story tower will have 200 apartments, a boutique hotel, a public square flanked by shops, and an observatory and restaurants at the top of the tower, once it is finished in 2019. Led by the deputy mayor Kobi Kahlon, the planning and local construction committee approved the project almost unanimously. Pepe Alalu was the only member of the Council who disagreed with the project, claiming that the tower exceeded the maximum permitted height with its 26 floors. Nonetheless, the committee approved the project last May, stating that the construction must begin within the next five years since otherwise the building permits could be revoked. Finally, the ‘Freedom Pyramid’ will be different to what Levi and Libeskind had originally anticipated. In 2011 the two architects unveiled a 24-storey building and a glass tower. Since then, the building design has been modified to include more services and the four floors of the shopping area. While the municipality of Jerusalem has been pushing to transform the city centre into a commercial, businesses and tourism centre in recent years, architects, urban planners and politicians have warned that high towers could harm the city’s unique historical heritage. The Jerusalem skyline is now dotted with a number of skyscrapers built in the past when the municipality did not enforce the city’s strict construction regulations. For this reason, Libeskind has declared that ‘the pyramid will be a bridge between ancient traditions and myths while providing a 21st century reinterpretation of this great construction… the design will complement the context and offer the neighbourhood a vibrant public space in the heart of the old city’.